Wild animals are just as susceptible to injury as our domesticated pets. Treating them, however, can prove to be quite a challenge. It is always a delicate balance when dealing with wild animals. You want to limit their exposure to humans during treatments, and you must watch the clock. The longer the animal is in captivity, the less likely a successful reentry to the wild will be. “Long term care is not ideal for high stress wild animals,” says Christine Cummings from A Place Called Hope (APCH), a non-profit rehabilitation and education center in Killingworth, CT. While they specialize in birds of prey, corvids (crow family) and vultures, APCH cares for all types of wild birds in need. After a rescue, their goal is to rehabilitate, re-nest and release the bird back into the wild whenever possible. APCH utilizes many rehab techniques and equipment to help accomplish this goal, including cold laser therapy. Christine shared a one recent case of an injured female Red-Tailed Hawk admitted to APCH with head trauma and a severe spinal injury. 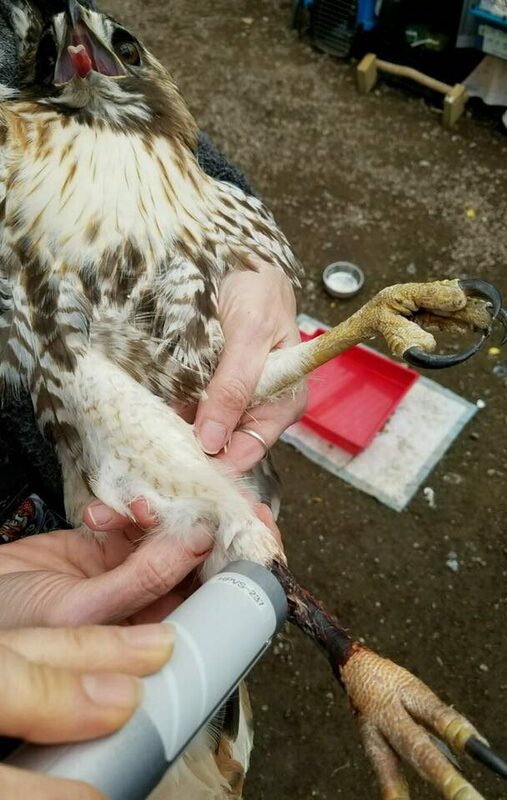 The hawk had been struck by a car, as 85% of their cases are. She was in critical condition when she came in, with no use of her legs and suffering neurological problems. There were no fractures, but swelling was so severe that she was paralyzed. “The cold laser system was immediately put to use as we treated the entire spinal and pelvic region,” shared Cummings. “It was only two days before we saw improvement. She regained circulation and started to move her legs and feet, yet her head trauma resulted in a disconnect as her coordination was sluggish. Continued laser treatments ultimately gave her back the full use of her legs and her ability to coordinate in just a few weeks. She is currently pending release,” she added with enthusiasm. Another wild bird organization incorporating laser therapy is The Florida Keys Wild Bird Center in Tavernier, Florida. The Wild Bird Center fulfills a similar mission to APCH, focusing on rescue, rehabilitation, and release of native and migratory birds in the beautiful and biologically diverse Florida Keys. Kayla Gainer, Wildlife Rehabilitation Manger at the Wild Bird Center, recently shared a story of one of their laser therapy patients. “Using the Respond Systems laser each day on the wing greatly increased the healing process,” Gainer stated. Laser Therapy delivered by Respond’s devices is used to treat all types of injuries. From factures and torn ligaments to wounds and nerve injuries, the laser is a wonderfully supportive therapy for healing with no side effects. The three primary benefits of the therapy are pain relief, reduction in inflammation and faster healing; all critical to helping the animals restore their ability to live out their lives in the wild. “This device puts wild birds back into the wild! It sends them home sooner than before and saves many lives we would have euthanized in the past. It’s the real deal!” concludes Christine. Respond is delighted to be a part of the great work being done at a Place Called Hope and Wild Bird Center, and will continue to share their stories! Respond Systems, Inc (RSI) has been manufacturing both cold laser and PEMF therapy in the USA for over 30 years. As a leader in product development and research, RSI’s mission is to improve the lives of animals through two of the most highly effective, versatile, and non-invasive therapy modalities on the market today. For more information visit www.respondsystems.com. For more information on A Place Called Hope visit http://aplacecalledhoperaptors.com and on the Florida Keys Wild Bird Center visit http://www.keepthemflying.org.